These terms and conditions apply to your use of the site and services owned or operated by International Centre of Cake Artistry Sdn Bhd. (“ICCA”). These terms and conditions do not apply to your use of unaffiliated site to which the ICCA site may link. 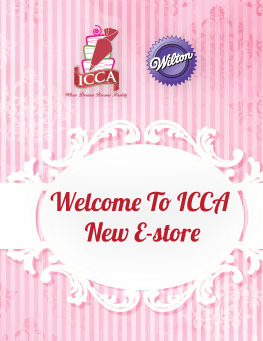 The contents of this site is protected by copyright and trademark laws, and is the property of ICCA. Unless we say otherwise, you may access the materials located within the site only for your personal use. This means you may download one copy of posted materials on a single computer for personal, noncommercial home use only, so long as you neither change nor delete any author attribution, trademark, legend or copyright notice. When you download copyrighted material, you do not obtain any ownership rights in that material. If, despite our request, you send us a submission for which no patent or patent application has been filed, it shall become our property. No submission will be subject to any obligation of confidence by us, and we will not be liable for any use or disclosure of any submission. We will exclusively own all known or later-existing rights to the submission worldwide, and will be entitled to the unrestricted use of the submission for any purpose, without compensation to the provider of the submission. We are not responsible for material appearing in any forum on the site, except for material signed by one of our identified representatives. We are not responsible for screening material posted by users for libel, obscenity, invasion of privacy, copyright or trademark infringement, accuracy, or for any other reason. We retain, however, the right to reject, modify or remove messages or other material that we, in our sole discretion, consider infringing, offensive, abusive, defamatory, obscene, stale, or otherwise unacceptable or that violate policies, these Terms and Conditions or any other agreements between the user and and/or its related entities. We also reserve the right to edit materials for any other reason. Whether or not we modify or remove such material, users remain solely responsible for the content of their messages or postings. By posting on the site, you grant (or warrant that the owner of such rights has expressly granted) us and/or relevant affiliated companies the worldwide, perpetual, nonexclusive right to use your questions, comments, and postings, in their original or edited form, in television programs, books, articles, commentaries, or in any other medium now known or later developed. You also warrant that you own or otherwise control all of the rights to the content you have posted and that the public posting and use of such content by us will not infringe the rights of any third party. Additionally, you warrant that any "moral rights" in posted materials have been waived. The information contained in or made available through the site (including but not limited to information contained on message boards, in text files, or in chats) cannot replace or substitute for the services of trained professionals in any field, including, but not limited to, financial, medical, or legal matters. In particular, you should regularly consult a doctor in all matters relating to physical or mental health, particularly concerning any symptoms that may require diagnosis or medical attention. We and our licensors or suppliers make no representations or warranties concerning any treatment, action, or application of medication or preparation by any person following the information offered or provided within or through the site. Neither we nor our partners, or any of their affiliates, will be liable for any direct, indirect, consequential, special, exemplary or other damages that may result, including but not limited to economic loss, injury, illness or death. The site is not directed to children under the age of 13 and we will not knowingly collect personally identifiable information from children under 13. WE STRONGLY RECOMMEND THAT PARENTS PARTICIPATE IN THEIR CHILDREN'S EXPLORATION OF THE INTERNET AND ANY ONLINE SERVICES AND USE THEIR BROWSER'S PARENTAL CONTROLS TO LIMIT THE AREAS OF THE INTERNET TO WHICH THEIR CHILDREN HAVE ACCESS. We control and operate this site from our offices in the Malaysia. We do not represent that materials on the site are appropriate or available for use in other locations. Persons who choose to access this site from other locations do so on their own initiative, and are responsible for compliance with local laws, if and to the extent local laws are applicable. These terms will be governed by and construed in accordance with the laws of Malaysia, without regard to any principles of conflicts of law. You agree that any action at law or in equity that arises out of or relates to these terms will be subject to binding arbitration in accordance with the Malaysia. If any of these terms and conditions are found unlawful, void, or for any reason unenforceable, then that provision will be considered severable from the remaining terms and conditions, and will not affect the validity and enforceability of the remaining provisions. This is the entire agreement between you and us relating to the subject matter it contains. This agreement may be modified only by our posting of changes to these terms and conditions, or by a writing signed by both parties. or via email to info@2decoratecakes.com.